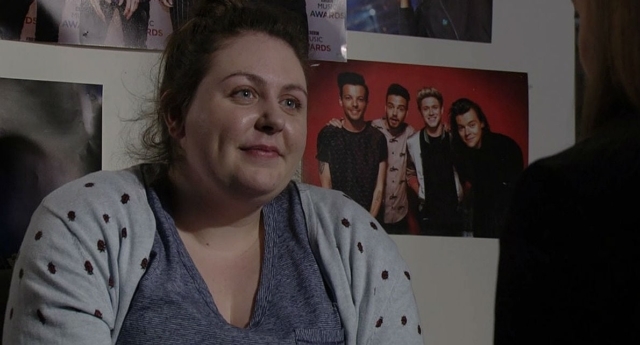 Monday night’s episode (28 May) had EastEnders fans suspecting whether Bernadette Taylor was struggling with her sexuality and feelings for best friend Tiffany Butcher. Now, the BBC One soap seems to have confirmed their theories. In the episode, Bernie (played by Clair Norris), her brother Keegan Baker (Zack Morris), best friend Tiff (Maisie Smith) and a few others broke into E20 out-of-business hours to have a few drinks and honour their late friend Shakil Kazemi (Shaheen Jafargholi), who was killed in a knife attack on Albert Square just last week. During their get-together, Tiff ended up smooching Bernie when she was dared to by her mates during a game of Spin the Bottle, despite being reluctant, calling them “little pervs” and saying she wasn’t going to do it just “to give [her friends] a cheap thrill”. Bernie, drunk and uncomfortable, seemed to get annoyed at Tiff for planting one on her unexpectedly and she got even more upset when Tiffany kissed Keegan in the following round. The next day, which was depicted in Tuesday night’s episode (29 May), Bernie began distancing herself from Tiffany and avoiding her pleas for them to spend a girly day together. Later on, Tiff confronted Bernie, believing that the awkwardness between them was because her BFF was mad at her for kissing her brother. Bernie’s face fell, and – while the character didn’t necessarily make it explicit – it was clear she was after a different outcome following the twosome’s fleeting kiss. Tiff noticed Bernie’s expression though and judging by the look on her face, it seems clear that she realises now that her friend, well, might like her more than just a friend. While it doesn’t seem as if Bernie’s feelings are reciprocated in this instance, this might be the start of a solo story line for the character. Not only in regards to dealing with Tiff not caring about her in the exact same way – although, who knows where the story will go at this point? – but also, as she begins to question her sexuality and come to terms with it. Emmerdale has Vanity; Coronation Street has Kana… Is it time for EastEnders to get its own queer women couple to ship? Only time will tell.